I’m cleansing…sort of. A friend recommended a raw cleanse and I am following her advice. I set aside two days and loaded up on carrots and celery. At the end of the first day, I’m not sure what I think. After eating one banana, a few apples, a bowl of cherries and a salad of romaine, tomatoes, cucumbers, and bell pepper, I wanted something a bit more substantial for dinner. I had grand plans of going to the store to pick up produce, but the lack of energy prevailed, and I turned to my refrigerator instead. 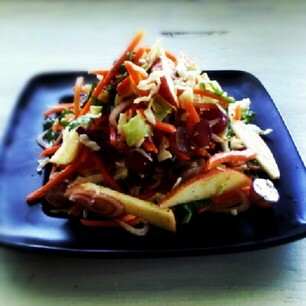 Using what I had on hand, i created this recipe for Raw Apple and Grape Coleslaw with Basil. 1. 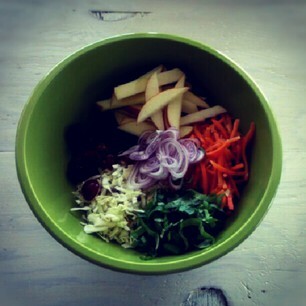 Combine cabbage, carrots, apple, grapes, basil and shallots in a salad bowl. 2. Toss the salad with lime juice, rice vinegar, mustard and season with paprika and black pepper, to taste. 3. Arrange the salad on a plate and sprinkle with sesame seeds. Perhaps, if you have more time, allow the salad to marinate for half an hour – but be sure to leave the basil out and add it at the end. Have you tried to follow a raw diet? Please share your success stories and favorite recipes!